Click here to email the Church Office. In Arroyo Grande, take the Fair Oaks exit, turning left from the off-ramp onto Fair Oaks. From Fair Oaks, turn right on Traffic Way, followed by a half-left onto South Traffic Way, just after the Mobil gas station but before the freeway on-ramp. Once you are on South Traffic Way, turn left on Trinity Avenue, and drive straight ahead to St. Barnabas’ Church (at the top of the hill). 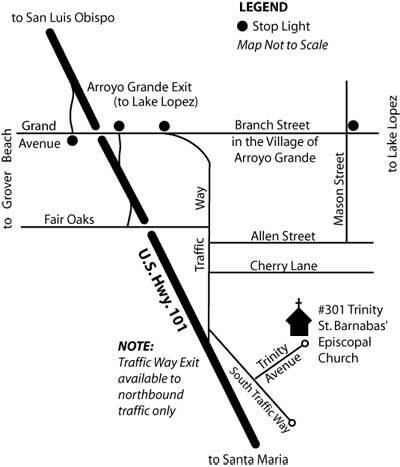 In Arroyo Grande, take Traffic Way, the first Arroyo Grande exit. Immediately make a hard right onto South Traffic Way (before the Mobil gas station). Next turn left onto Trinity Avenue, and drive straight ahead to St. Barnabas’ Church (at the top of the hill).